A new style swimming head + blade swimming bait, PRORIG SPIN. Balanced head design for maximum wobbling. Fitted with an assist hook eye to increase hook-up rates on short and blade bites. The more you use PRORIG SPIN the more you will come to realise it has the power to attract schooling bass away from bait fish, while being balanced enough to catch suspending bass that would shy away from spinner baits. Y using straight soft lures such as POWER BALANCE, LADY FISH or ECOGEAR's GRASS MINNOW or power shad, not only does it have great action on retrieve, but also during fall. The tried and tested CRYSTAL S has an amazing flashing effect, also the mixed current caused by the blade makes the soft lure move in ways not possible until now. Please use a split ring on the assist hook eye, with #6 or #8 treble hooks. 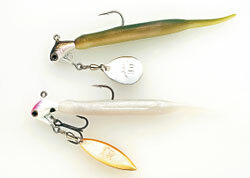 When using straight lure 4" size is best, however with shad tail lures 3.5" is perfect. 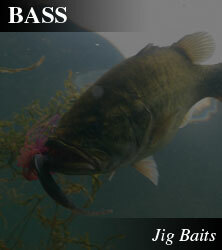 Using a smaller lure will keep the lure volume down, but fall and retrieve will become faster. In the opposite way, using a larger plastic will slow down the lure. You can attach an assist hook as well.